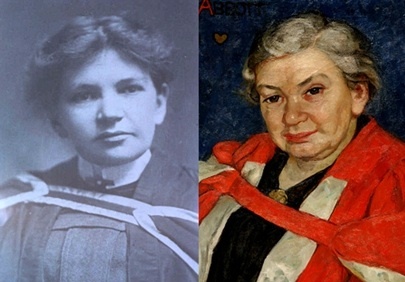 Maude Abbott / McGill Archives. While cycling to work recently, I wiped out in the “devil’s strip” at the corner of St. Catherine Street and McGill College Avenue. My front tire had caught in a huge hunk of shiny metal protruding out of the old Montreal streetcar track. This shiny hard steel track was installed about 100 years ago, and was part of a two-way system of electric streetcars that ran the length and breadth of Montreal. In the old days the streetcar tracks were laid so close together that there was less than a half metre of clearance between the cars when they passed each other. The space between the tracks was called the ‘devil’s strip’ and to be caught between passing cars often led to fatal injuries. As Abbott noted in her “Autobiographical sketch” it was Osler who “quietly dropped the seed” by inviting her to contribute a chapter on the subject of heart disease to the 1907 edition of his textbook Systems of Modern Medicine. When this book was published it immediately promoted Abbott as the world’s authority on the field of congenital heart disease. The seed that Osler planted within Maude’s passionate nature blossomed dramatically after this date. Although she was not meant to teach in her official capacity as curator of the Medical Museum, she roguishly began informal classes in pathology, using her museum specimens as teaching tools and props. About 100 years ago, despite her rebellious activities, McGill finally recognized her international reputation and awarded her an honorary medical degree in 1910. She was officially appointed to the academic staff with a title of lecturer. The 1910-11 McGill Calendar lists Abbott within the Officers of Instruction pages. There are 248 in total. Seven are women. Carrie Derick is listed as “Part-time Lecturer in Genetics” and the other five women are titled as either “Warden,” “Registrar” or “Demonstrator.” These instructors taught a total of 893 students, all of them male. The class photos from each division show them proudly massed in front of their respective buildings looking very dapper in bowler hats and waistcoats. We know that Maudie’s faculty, Medicine, was competitive on the international scene in 1910 because the new Strathcona Anatomy and Dentistry building had been endowed and constructed with state-of-the-art labs and facilities such as dissecting chambers and preparation units. However, women were not admitted to McGill Medicine until 1919. When the first five women graduated in 1922 it was Abbott who took them out for a special reception in their honour at the Ritz Carlton Hotel. Abbott died of a cerebral brain hemorrhage in the summer of 1940. According to Dr. Rick Fraser, the current curator at McGill’s Medical Museum and keeper of the Maudie flame, it would be difficult to overemphasize the importance of her work in classifying congenital affections of the heart. Even if the technical achievements of surgery and anesthesia had been possible before her work, he says that surgical therapy would have been impossible or, at least, completely empirical without her 1936 Atlas of Congenital Cardiac Disease which documents 1000 cases of clinical, pathological and morphological abnormalities of the heart. Still fundamental for students’ understanding of cardiac surgery today, this work positioned her as a “person of national historic significance” by the Historic Sites and Monuments Board of Canada in 1993 and helped to induct her into the Canadian Medical Hall of Fame in 1994. A few weeks ago I stood in a hot Auditorium at the Ibero-Americana University in Tlalpan, Mexico gazing at a 10-metre-high wall mural depicting the medical history of cardiology. Perched in the top left hand corner was the soft, grey-haired profile of Maude Abbott. She is the only woman and the only Canadian featured in this pantheon of modern heart specialists. Painted by Diego Rivera in 1944, under guidance and sponsorship of Ignacio Chávez, the Director of Mexico’s National Institute of Cardiology, this fresco pays tribute to all the clinical doctors responsible for diagnosis or therapeutic advances in matters of the heart. Created in 1944, four years after Abbott’s death, her life-size image firmly anchors her as a world-renowned scientific figure. Ironically, the only remembrance of Maude at McGill is her incorrectly-spelled name on the door leading into the powder room at the Faculty Club. Ingrid Birker is the Science Outreach Co-ordinator for the Faculty of Science and the Redpath Museum.